Why are the sectarian attacks on Pakistani Shia community continuing un-abated? What can be done to stop this carnage? Will Punjab government crack down harder on the Punjab-based sectarian outfits? What will be the outcome of President Obama's summit on "Countering Violent Extremism"? Has the PMLN government changed routing of China-Pak Economic Corridor (CPEC) to run it through Punjab and Sindh at the expense of Khyber-Pukhtunkhwa and Balochistan? Is this only an interim route to make CPEC operational more quickly by using existing infrastructure? Are there security and terrain challenges with the original route? Has China bought into this change? Is India engaged in cover-up with its constantly changing story of the Indian Coast Guard's unprovoked attack on a Pakistani fishing boat and the killing of innocent Pakistani fishermen? ViewPoint from Overseas host Faraz Darvesh discusses these questions with well-known Pakistani journalist Raza Rumi in Washington and panelists Misbah Azam(politicsinpakistan.com) and Riaz Haq (www.riazhaq.com) in Silicon Valley. Pakistan Sectarian Terror; China-Pak Corridor Route; India "Fishy" Boat Story from WBT TV on Vimeo. Traditionally, the Chinese side stays clear of Pakistan’s internal political controversies. Its interest in the project is, however, obvious. It extends its economic outreach in general and opens up laggard western regions to the world. The equity argument to bring these regions on a par with others ends at Khunjerab. Beyond Khunjerab, hard economics takes over. As the principal investor, the Chinese side would look for the quickest and the most cost-effective route to Gwadar. It is also necessary to make this sleepy port functional. Security costs may also have been factored in. As a recipient with minimal choices, this is what the government seems to be doing by filling the gaps in the Havelian-Islamabad-Lahore-Multan-Sukkur-Ratodero-Khuzdar-Gwadar route. Four ‘early harvest’ projects — land acquisition and shifting of utilities for the Karachi-Lahore motorway, construction of the Lahore-Abdul Hakim-Khanewal section, construction of the Multan-Sukkur section and construction of the Raikot-Havelian-Islamabad section — were included in the Public Sector Development Programme of 2014-15. The last two are largely financed by Chinese credit. Earlier this month, a delegation visited China to fast-track these projects. No one knows which was the original route. The opposition claims that it passed through southern K-P, Zhob and Quetta. This is the shortest but the costliest route in terms of time and money. What was the opposition doing when the projects related to the eastern route were made part of the development budget? Waking up to the change now rather than debating it in the budget session reflects politicians proverbial lack of interest in economic matters. This late realisation and insistence on the most difficult route might endanger the entire Pakistan-China Economic Corridor project, which includes a focus on energy and economic zones and not just transit trade. 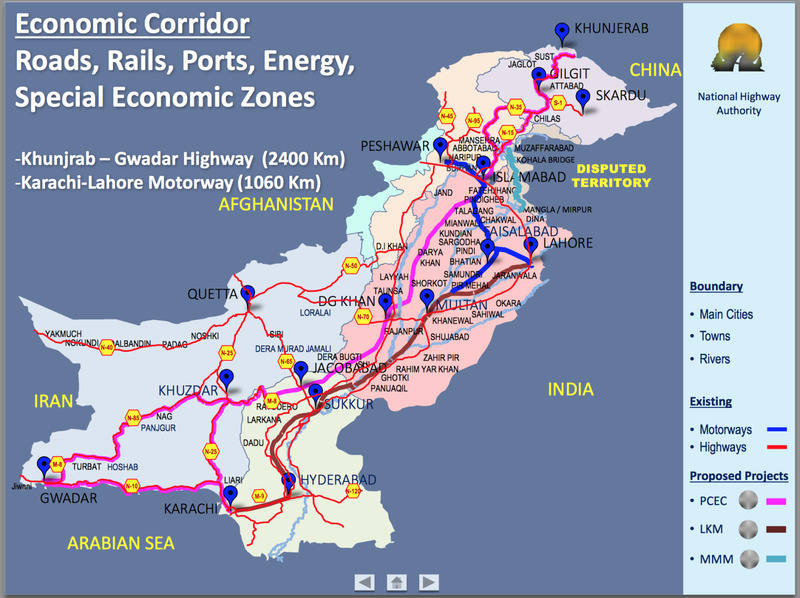 In terms of cost, economic advantage and future opportunities, the middle ground is occupied by the route connecting Abbottabad, Mianwali, D I Khan, D G Khan, Ratodero, Khuzdar, Turbat and Gwadar. The route fulfils the original dream of the Indus Highway as an alternative artery. It connects the backward districts of all the provinces and is linked to Fata, Quetta and Zhob. Proximity to Central Asia, Afghanistan and Iran brings the concept of the economic corridor into full bloom. The time to exploit the full potential of Gwadar will also be reduced. When all but one opposition party meets, as is being reported in the press, the one deemed to promote the cause of just one province, it is hoped that the development of Pakistan will be the main consideration. The current focus of the government on completing the eastern route may make immediate economic sense, but its long-term potential is limited. The Chinese fully understand that the opening up of new areas pushes the frontiers of economic opportunity further, while diminishing returns set in quickly from investment in relatively developed areas. So the equity argument does not end at the Chinese border. It extends to Pakistan also but without sacrificing the economic advantage. There could be no better Marshall plan than this connectivity. The federal cabinet of Pakistan, during a meeting Monday, approved the Pakistan-China economic corridor, a media report said. Approval was also given along for starting negotiations with Beijing for importing 1,000 megawatts of electricity from China by laying a new transmission line, Dawn online reported. The Pakistan-China Economic Corridor (PCEC) is the country's biggest road project launched by the government. Work on one of the sections of the PCEC was initiated in December 2014, under which a motorway from Havelian to Thakot as phase one of the Islamabad-Raikot section of the corridor would be constructed. The Havalian to Thakot section of the corridor is being financed by China while other phases will be carried out on the basis of build, operate and Transfer (BOT). Three militant groups in Pakistan say they have joined forces, potentially giving that country’s Taliban insurgents more heft to resist a military campaign by the government and stepping up the general threat from extremist organizations. A joint statement on Thursday said a splinter group from Mohmand, in the country’s tribal areas, had rejoined the main Pakistani Taliban faction, while Mangal Bagh, a warlord in the Khyber region who wasn’t previously part of the Taliban, had now allied himself and his followers with it. “We warn the Pakistani infidel system, its agents and this apostate army that we will not let their plans succeed under any circumstances,” the statement said. Pakistani security officials declined to comment. The convergence comes as the governments of Pakistan and neighboring Afghanistan are making tentative efforts to bring the Afghan Taliban into peace talks. In recent months, relations between Pakistan and Afghanistan have dramatically improved, leading to action by Afghan forces against the Pakistani Taliban presence in their country. The three militant groups, which have links to al Qaeda, hold sway over territory on both sides of the Pakistan-Afghanistan border, further complicating military measures against them. Together, the three groups have influence over a chunk of the tribal areas—Mohmand, Bajaur and Khyber regions—as well as a presence in the bordering eastern Afghan provinces of Nangarhar, Kunar and Nuristan. The three factions would now be under a united command, to be run by a committee for now. The groups didn’t name the overall head in their statement. The only major militant faction now still outside of the Pakistani Taliban is the group led by a commander known as Sajna, who is based in Waziristan and has many fighters from the powerful Mehsud tribe under him. The Pakistani Taliban are nominally loyal to Mullah Mohammad Omar, the elusive leader of the Afghan Taliban, but the Pakistani militants operate independently. The main Pakistani Taliban faction is led by a militant going by the name of Mullah Fazlullah, who the Pakistani government says is based in eastern Afghanistan. The announcement comes as Islamic State, the militant group that holds large swaths of territory in Syria and Iraq, makes inroads into Pakistan and Afghanistan. Some Pakistani Taliban leaders have pledged allegiance to Islamic State, and officials in Islamabad and Kabul worry more militants might make the switch if the Afghan Taliban conclude a peace settlement with the Afghan government. The Pakistani Taliban splinter group from Mohmand is a particularly hard-line faction, which had opposed the peace talks held by the Pakistani government with the Pakistani Taliban in early 2014. It also has influence in Bajaur, another key tribal area. The warlord Mr. Bagh brings significant manpower to the militants’ table, along with a network located on the edge of Peshawar, the most significant city in Pakistan’s northwest. And the main land route for transporting supplies in and out of Afghanistan passes through the Khyber region, where his group operates. In June, the army unleashed a major offensive that is still under way against the Pakistani Taliban base in North Waziristan, part of the tribal areas along the Afghan border. An operation was later launched in Khyber. The Pakistani Taliban, responsible for some of the bloodiest attacks against security forces and civilians in the country, have been on the defensive since then. The group claimed responsibility for a massacre at a school in Peshawar in December that left more than 130 children dead. Beijing’s focus and commitment to the PCEC is also manifest in the recent visit to Islamabad of a high profile Chinese expert group on long-term planning of the PCEC. Led by Hu Dongsheng, deputy director general of the China Development Bank, the 19-member group held extensive discussions on the project. Both sides emphasised the need to speed up the process of drafting the PCEC long-term plan, which includes not only roads but a lot of social infrastructure in Balochistan and other areas aligned with the corridor. If realised, the PCEC will not only benefit Pakistan in terms of improvement of its economy and security condition, but also contribute to regional peace, stability and prosperity. The Gwadar-Kashghar route was originally planned to run through Bisima, Khuzdar, Kalat and Quetta onto Zhob, D I Khan, Hassan Abdal and onwards to Kashghar but it has been changed to Bisima, Ratodero and towards Punjab, which means bypassing the Baloch and Pakhtun areas. That is why there were recent protests in the Senate by members from Khyber- Pashtunkhwa (K-P), Fata and Balochistan. According to the new plan, the corridor route turns from Havelian towards the east and links up with the Islamabad-Lahore Motorway, to include Punjab. From here, the corridor is linked to the Lahore-Karachi Motorway and then to Gwadar. Officials at the Planning Commission argue that the completion of infrastructure in K-P and Balochistan will take a few years and thus it was imperative to utilise the existing infrastructure. This was done, insist officials, to accommodate Chinese concerns rooted in the security condition in K-P and Balochistan. Apparently, the federal government altered the PCEC route and made it longer by 300 kilometres, without taking the Pakhtun and Baloch stakeholders into confidence. This is yet another example of the surreptitious and the high-handed approach towards the smaller provinces. The reaction from within the two provinces was natural and requires attention by the federal government. As this bickering simmers in Pakistan, the Chinese leadership is worrying about future developments. President Xi is expected to visit Islamabad soon and will hopefully provide a fresh impetus to the PCEC-related projects, which Beijing firmly remains committed to. Chinese officials say the corridor project is not just meant for one region, but for the economic development of the whole of Pakistan. Chinese diplomats in Islamabad are both enthusiastic as well as concerned about the controversy surrounding the corridor. There will be quite a spectacle if protestors from Balochistan and K-P greeted President Xi, said an official. Why can’t Pakistani leaders sit together and flesh out the issues in an amicable and transparent way, wondered another visitor from Beijing. While there may have been complex internal security challenges as well as Chinese concerns that might have prompted changes in the corridor route but why was this done in such a controversial manner? Pakistan needs unity, transparent political conduct and a people-focused commitment like never before. Pakistani marine forces on Saturday arrested 47 Indian fishermen who were accused of violating Pakistan’s territorial waters in the Arabian Sea, the police said. Pakistan’s Maritime Security Agency also seized eight boats belonging to the fishermen, who it said had strayed into Pakistani waters. The fishermen were handed over to the police in the port city of Karachi. Such arrests are frequently carried out by both countries; the maritime border in the Arabian Sea is poorly defined and many fishing boats lack the technology needed to be certain of their precise location. The fishermen often languish in jail because the poor diplomatic relationship between Pakistan and India makes it difficult to resolve the cases. Pakistan released 172 Indian fishermen in February as “a good-will gesture” but arrested 45 others last month. Out of the $28 billion worth projects, Punjab gets $11 billion, Khyber Pakhtunkhwa (KP) $2.5 billion and Balochistan gets nothing. That’s right, not a single penny out of $28 billion would be spent in Balochistan which is the most backward province in Pakistan. Sindh would get $9 billion from these projects; however the major chunk of that amount would be for the Lahore-Karachi Motorway, a project meant for Lahore. There is no justifiable reason whatsoever which can be floated to defend this unjust division of projects among the four federating units of Pakistan. During the agreement signing ceremony that took place in Prime Minister House on April 20, only the Punjab Chief Minister was present. The other three chief ministers were not invited. It’s not just about invitations, no person from Balochistan and KP was chosen for the workgroups that finalized the details of CPEC with Chinese officials. It would not be an exaggeration to say that Prime Minister Nawaz Sharif and his brother Shehbaz Sharif orchestrated the show only to benefit their support base in Punjab. This deal that was supposed to bring prosperity to Pakistan has become controversial from the outset. The KP Chief Minister, Pervez Khattak has openly criticized the federal government for preferring Punjab over other provinces. The legislators of Balochistan Assembly dubbed the agreements between Pakistan and China as between Lahore and Beijing. Shah Mahmood Qureshi, Vice president of PTI, who also belongs from Punjab, has criticized the federal government for its Punjab-centric approach in distribution of CPEC projects. The route of CPEC rail and road link was the first thing that triggered the controversy. The original route of CPEC would pass from the center of the country. It would start from Gwadar-Ratodero-Dear Allah Yar-Dera Ghazi Khan-D.I Khan-Hassanabdal and all the way to Kashghar. PML-N government has created confusion over the original route. They have come up with a mindboggling concoction that the CPEC would not be one road but a network of roads. That’s wildly untrue because as per the original plan, there would be one main route, ranging from 2 to 6 lanes. During the agreement signing ceremony, the government of Pakistan agreed with China on the eastern route that would take the Gwadar-Ratodero-Sukkur-Lahore-Islamabad-Abbotabad route. Clearly this route is meant to benefit Lahore at the expense of two backward provinces of Pakistan, Balochistan and KP. Coming to the inaugurated projects, Lahore already has a Metro Bus service, but the government of Pakistan is establishing an Orange Line Mass Rail transit system in the city. China would provide $1.6 billion for this project. A branch of Industrial and Commercial Bank of China would be established in Lahore. And where would the China Cultural Centre be established? No prizes for guessing. Would it not be fair if these projects were divided equally among all four provincial capitals? I guess it would not be acceptable to the Punjab centric agenda of PML-N. Protests have already erupted against what is being termed as China-Punjab economic corridor. Right and left wing parties in both KP and Balochistan are on the same page on this issue, which is a rare occurrence. Federal Minister Ahsan Iqbal has already given his verdict on the protestors and he is in the process of distributing certificates of treachery. He said, “Hidden hands, some politicians, and also India are trying to make the multi-billion dollar framework [CPEC] controversial.” According to the criteria set forth by Mr. Ahsan Iqbal, this article must also be the work of hidden hands to sabotage the interests of Pakistan. Fortunately, for PML-N government, a draconian cybercrime bill is in the pipeline that would be used to crush any dissent to anti-federation policies of their government on internet. Political parties on Thursday hammered out a consensus on the route of Pak-China Economic Corridor during an All Parties Conference chaired by Prime Minister Nawaz Sharif. The APC agreed that the western route of the corridor would be completed first, which would be built from Hasan Abdal to Gwadar, passing through Mianwali, Dera Ismail Khan and Zohb. The prime minister told the meeting that a parliamentary committee would be formed to monitor the project while working groups would also be formed to address the concerns of all the provinces. The prime minister said China had provided a unique opportunity in the form of economic corridor. During the meeting, Federal Minister for Planning and Development Ahsan Iqbal said no new road would be built as part of the project instead different roads would be connected to link them with Khunjrab. He dispelled the notion about a change in the original route of the Pak-China Economic Corridor. The minister told the participants of the APC that the Pak-China corridor was not only the name of a road rather it was a portfolio consisted of different projects, including infrastructure, energy, Gwadar port and industrial cooperation. This was the second APC to be called on the CPEC project. The first APC took place on May 13. The conference has been called to build consensus among political parties and remove any concerns they have regarding the mega project. "I hope this becomes a tradition that even in the future we sit together to bring about consensus to move forward on national issues," said Sharif in his opening address to the attendants of the meeting. ISLAMABAD, Pakistan — The leader of a banned Sunni extremist group that is believed to have killed hundreds of Pakistani Shiites in a series of bombings died in a shootout Wednesday after supporters tried to free him from police custody, the Pakistani authorities said. Thirteen supporters of Malik Ishaq, the leader of Lashkar-e-Jhangvi, were also killed in the clash early Wednesday morning in Punjab Province, said Shuja Khanzada, Punjab’s home minister. Mr. Khanzada said armed supporters attacked a police convoy that was transporting Mr. Ishaq, his sons and three of his aides, all of whom had been arrested Saturday on suspicion of involvement in sectarian killings. The two sons were among the dead, Mr. Khanzada said. Six police officers were wounded, and some of the attackers escaped, according to the police. Lashkar-e-Jhangvi has claimed responsibility for the deaths of hundreds of Shiites, including two bombings in the western city of Quetta in early 2013 that killed nearly 200 people. Additionally, Mr. Ishaq was accused of having masterminded a 2009 attack on Sri Lanka’s cricket team in the eastern city of Lahore. Mr. Ishaq was imprisoned from 1997 to 2011 and had been accused in more than 60 criminal cases, but he was never successfully prosecuted. Analysts called that a reflection of Pakistan’s weak judicial system, in which militants are able to intimidate judges and witnesses, as well as political leaders. Arif Rafiq, an adjunct fellow at the Washington-based Middle East Institute, who has written extensively on sectarianism and militancy in Pakistan, said Mr. Ishaq’s killing had “significant symbolic value.” His release from prison in 2011 “represented the impunity that anti-Shia terrorists enjoyed in Pakistan,” particularly in Punjab Province, Mr. Rafiq said. In recent years, however, Mr. Ishaq had been supplanted by a younger generation of militants, Mr. Rafiq said. “Still, his killing is an indication that the Pakistani state is serious about targeting anti-Shia militants,” he said. Mr. Rafiq noted that Pakistan had seen a substantial decline in sectarian attacks in the past year, since the Pakistani military began an offensive against militant hide-outs in the country’s rugged semiautonomous tribal regions. Some Pakistanis expressed skepticism about the official account of Mr. Ishaq’s killing, noting that Pakistan, and Punjab Province in particular, has a history of extrajudicial killings of militants by the security forces. “Malik Ishaq’s killing in a suspect police encounter shows that the state itself does not seem to have faith in its own legal and justice system,” said Omar R. Quraishi, an editor at the ARY News network. Sir Creek, a narrow estuary that divides India and Pakistan in the Arabian Sea, has been part of a long-simmering maritime boundary dispute between the two nations for decades. Hundreds of thousands of fishermen from the two countries have found themselves caught in the middle. Many of them have been arrested or imprisoned after inadvertently crossing the perceived boundary in pursuit of ribbon fish, pomfret and prawns. Here’s a look into the numbers related to the Sir Creek dispute and the fishermen held by the maritime authorities of Pakistan and India from the area. The number of fishermen in Indian and Pakistani jails for illegally crossing the disputed border at sea. Among them, 355 Indian fishermen are in Pakistani jails and 27 Pakistani fishermen are in Indian jails, according to Pakistan’s Foreign Ministry. India’s Foreign Ministry declined to comment. The length of the Sir Creek tidal channel, situated in the marshy land of the Rann of Kutch, which lies on the border between the Indian state of Gujarat and the Pakistani state of Sindh. The width of Sir Creek, according to experts. India claims the border lies at the middle of the navigable channel of the creek. Pakistan claims the whole creek and says its border extends from the Indian coast. As the waterway is 8 miles to 9 miles wide where it opens into the sea, the line effectively determines sovereignty over hundreds of square miles of prime fishing waters and potential oil-and-gas reserves. When talks to resolve the Sir Creek border dispute between Indian and Pakistan began–they have been taking place on and off since then. The most-recent round of talks to address the issue of the river and the demarcation of the maritime border was held in 2012. The distance from each country into the creek that both sides have agreed is off limits to fishing until the maritime boundary dispute is settled. Still, fishermen sometimes cross unintentionally over the perceived boundary citing lack of global-positioning devices in their boats or the knowledge to operate them. In its fight against the Tehreek-e-Taliban Pakistan and its affiliates, many of whom are from Deobandi sectarian outfits like Lashkar-e-Jhangvi and Jaish-e-Mohammad, the security forces and their intelligence agencies have used a two-pronged approach: fight, capture and kill those who cannot be convinced to lay down arms and co-opt those who can be weaned from violence. There’s nothing radical about these two approaches. They have been tried, mostly in tandem, in other conflict zones, with varying degrees of success. In the case of Ludhianvi, he, and some of his lieutenants were co-opted by the intelligence agencies as part of the operation to clean up Punjab of sectarian terrorism. Ludhianvi was also used to bring in Malik Ishaq, one of the most dreaded sectarian terrorists and the face of the banned Lashkar-e-Jhangvi. The same group also provided help to, and facilitated, terrorist attacks by the TTP and its Jama’at-ul-Ahrar faction. Ishaq did initially come round and stayed away from violence for some time, but went back to his old habits. That created a rift between his group and Ludhianvi’s and his hitmen also killed a close associate of Ludhianvi’s. It was at that point that counter-terrorism (CT) experts decided that Ishaq needed to be sent to his Maker. Ishaq was killed in a shootout along with his two sons, his consigliere, Ghulam Rasool Shah, and several hitmen. The dead Ishaq and the living Ludhianvi are metaphors for the two-pronged CT strategy that has been at play. There has been much criticism of what some call mainstreaming these terrorists. Personally, I am not keen on the term. The strategy is more about coopting than mainstreaming.